Marco Rubio has rebranded his presidential campaign as the “NeverTrump” candidacy, trying to appeal to conservatives who regard the current front-runner as a dangerous authoritarian they could never support, even if nominated. But it’s clear that Rubio does not subscribe to the “NeverTrump” analysis. At Thursday night’s debate, he conceded he would vote for whomever the party nominates, even Trump. Asked about it again on a radio interview, Rubio reaffirmed his position. “For me, I’m never voting for Donald Trump in the Republican primary … that’s the point that I was making,” he explained. So that means Rubio can count on at least one vote for himself in Florida’s March 15 primary. Obviously, the (completely justified) passion behind the NeverTrump movement is useful for Rubio’s political ambitions. But it’s only useful up until such time as the party selects a nominee. 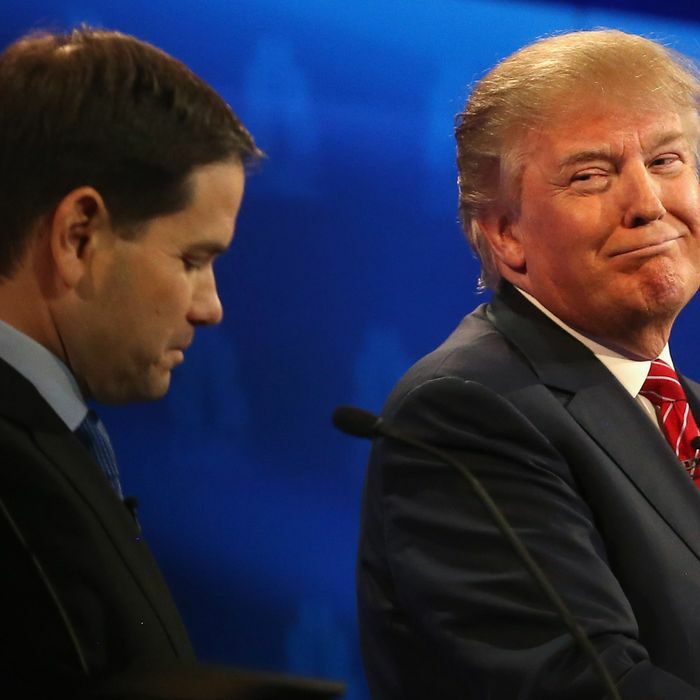 If the nominee is Trump, Rubio will need to fall in line to have a career in Republican politics. And if Rubio manages to pull the nomination out of some contested-convention scenario, he’ll also need to patch things up with Trump so his voters turn out. But by admitting he’s not really with “NeverTrump,” Rubio undercuts his appeal to Republican elites. The point of that campaign is to tell the party Establishment not to make its peace with Trump. A Trump nomination, they are saying, will split the party in two and cause a large schismatic faction to either stay home or back a splinter candidacy. That threat is designed to stop, or at least slow, the trickle of Establishment surrender to the front-runner. But that tactic only works if the NeverTrumpers can make the threat credible. Some of them will follow through, but a lot of them — especially the ones whose careers are most closely tied to partisan politics — are bluffing. Rubio has been forced to show his hand.